Welcome to the Celebration of the IAU100 in Puerto Rico! 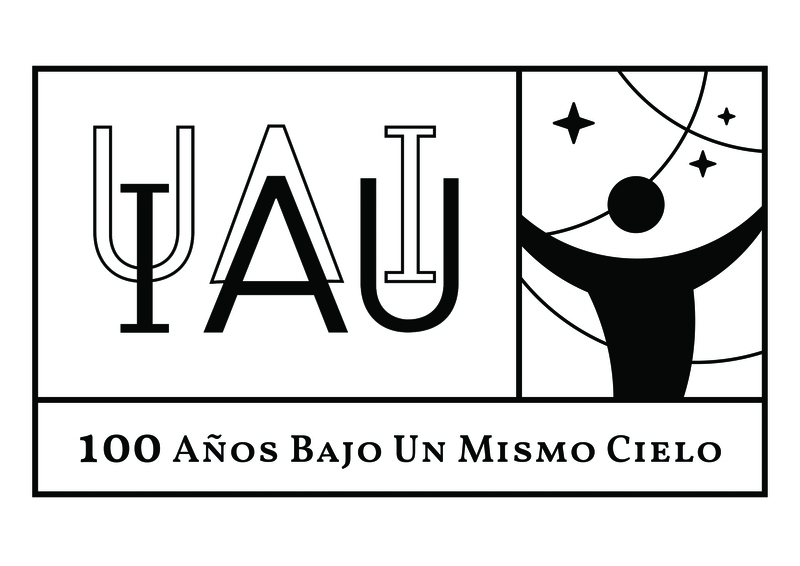 In 2019, the International Astronomical Union (IAU) is celebrating its 100th anniversary https://iau-100.org. To commemorate this milestone, the IAU is organising a year-long celebration to increase awareness of a century of astronomical discoveries as well as to support and improve the use of astronomy as a tool for education, development and diplomacy under the central theme "Under One Sky". In Puerto Rico the celebration events are coordinated by the Puerto Rico IAU100 National Committee. This committee will implement the IAU100 Global Projects and coordinate activities and events in Puerto Rico. The National Organizing Committe Person of Contact is Dr. Mayra Lebrón from the University of Puerto Rico, Río Piedras Campus. January 21, 2019 - Eclipse Observations were a success! Students with their teachers at "Colegio San Antonio de Padua" in Río Piedras observed the 2019 eclipse of the Moon. The event had telescopes available, and the teachers Professors Hernán Molina and Juan C. Velázquez gave talks about what was going on. The students enjoyed an astronomy activity combined with camping at the facilities of the Observatory allowing them to have the full eclipse experience. February 4, 2019 - Public Talk: "Einstein, Eddington and Me, 100 Years of Passing the Tests." Dr. Dale Ferguson, Visiting Scientist at Arecibo Observatory from Air Force Office of Scientific Research. Talk at UPR-Rio Piedras, Faculty of Natural Sciences, A-211, 10:00 am. February 11, 2019 “Girls In Space at Arecibo Observatory" (Feb11 is the UN International Day of Women and Girls in Science). This activity is organized by Dr. Alessandra Abe Pacini (Arecibo Observatory). There will be presentations about Space Science, the science done at Arecibo Observatory and about the project "Girls In Space". One hundred girls from two different schools are expected (between 13-15 years-old) for this event. It will include a panel of scientists from Brazil, NASA and South Africa. 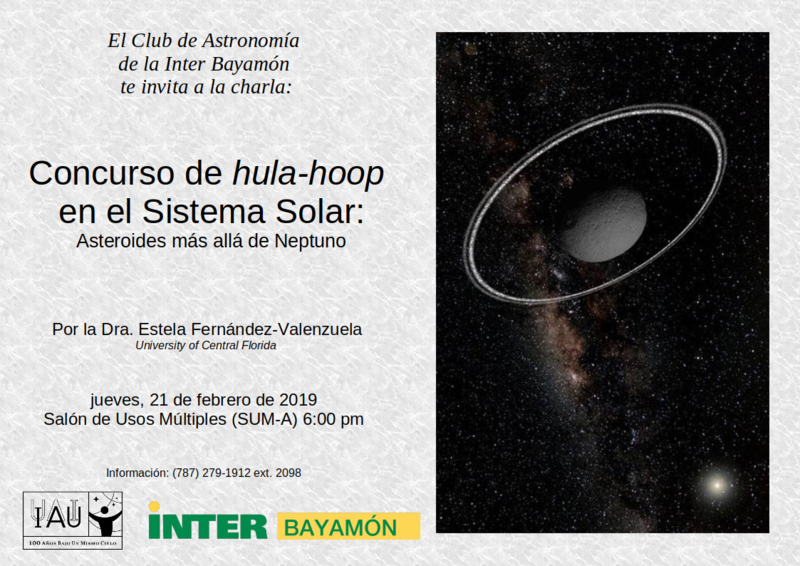 February 21, 2019 - "Concurso de Hula-Hoop en el Sistema Solar:Asteroides Más Allá de Neptuno" Astronomy Talk by Dr. Estela Fernández-Valenzuela University of Central Florida at the Interamerican University-Bayamón, Salón de Usos Múltiples (SUM-A), 6:00pm. For more information: (787) 279-1912 ext 2098. 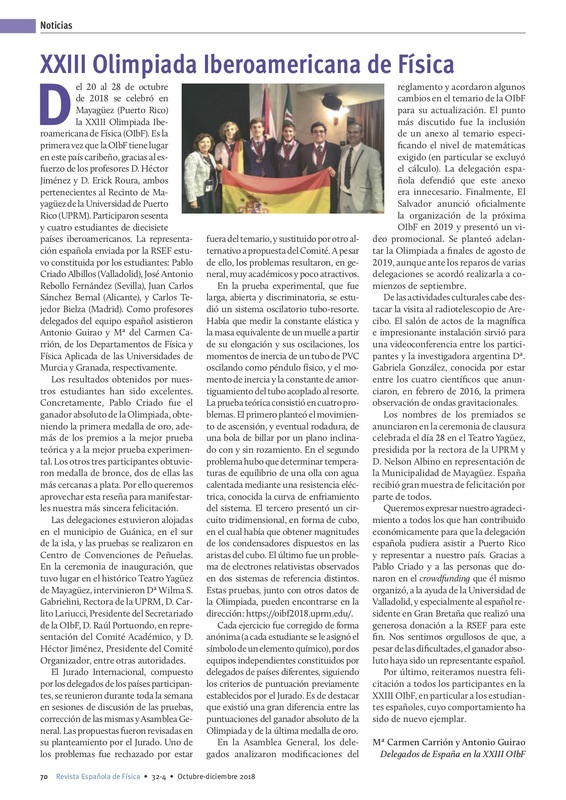 March 1, 2019 A review of the Physics Olympiad that took place in Puerto Rico (October 20-28, 2018) has been published in the "Revista Española de Física"
March 2, 2019 Observation Night:"Vieques bajo las Estrellas" Saturday, March 2, 2019 from 6pm to 11pm at the Malecón del Barrio Esperanza located south of Vieques. Activity open to the general public and free of charge. Organized by the Sociedad de Astronomía de Puerto Rico. March 3, 2019 Physics Education Conference at Uruguay: XIII Conferencia Interamericana de Educación en Física “Dr. Alberto Maiztegui” URUGUAY 2019 http://ciaef.edu.uy/. March 3, 2019 Communication in Science Conference in Panama: La Red de Popularización de la Ciencia y la Tecnología en América Latina y el Caribe (RedPOP) tienen su 16º Congreso de RedPOP del 22 al 25 de abril de 2019 en Panamá http://www.redpop2019.org/. March 3, 2019 Erathosthenes Experiment: The experiment will take place on the 21st of March. For more information http://eratosthenes.ea.gr/. March 9, 2019 Observation Night: "Noche de Observación Bajo Cielos Obscuros" Sociedad de Astronomía del Caribe - 9 de Marzo, 2019 desde 6:45 pm en Carr. 303 km. 11.3 interior, entrando por el camino “La Gran Vía”, en La Pitahaya, Cabo Rojo. 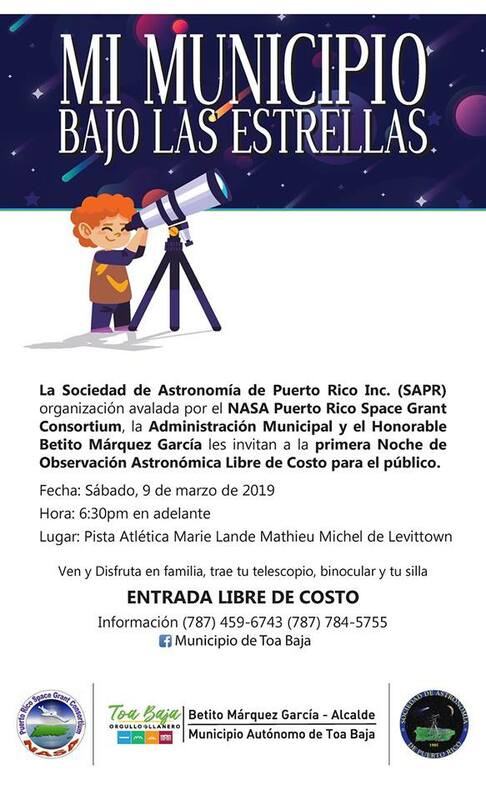 March 9, 2019 Observation Night: "Mi Municipio Bajo las Estrellas" Sociedad de Astronomía de Puerto Rico - 9 de Marzo, 2019 desde 6:30 Lugar:Pista Atlética Marie Lande Mathieu de Levittown. 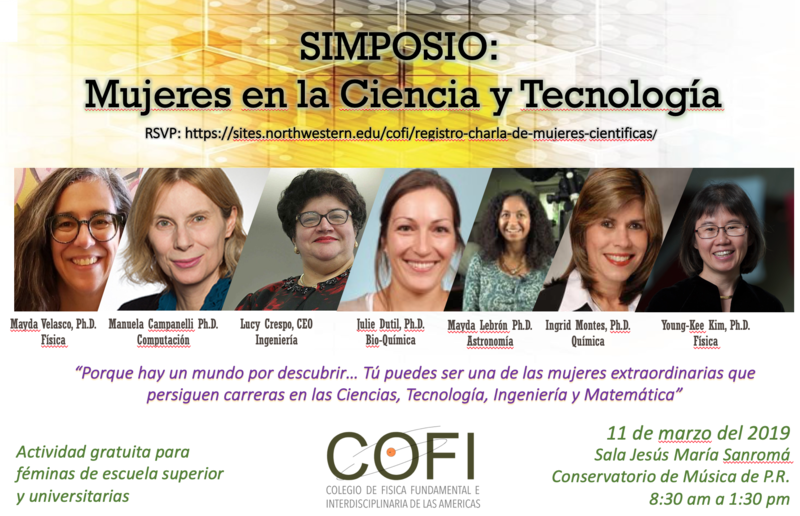 March 11, 2019, Symposium: "Women in Science and Technology" Activity for women in High School and College. March 11, 2019 8:30 a.m. - 1:30 p.m., Conservatorio de Musica de Puerto Rico, Sala Jesús María Sanromá, Activity Organized by the Colegio de Física Fundamental e Interdisciplinaria de las Américas (COFI) RSVP https://sites.northwestern.edu/cofi/registro-charla-de-mujeres-cientificas/. March 12, 2019, Public Talk: "Revealing The Hidden Universe With Black Hole Mergers" Prof. Manuela Campanelli- ​Rochester Institute of Technology, Distinguished Lecture on Astronomy, Open to the public, free admission, 2019 March 12, 3:30 pm Arecibo Observatory - Visitor Center. April 8 and 9, 2019, NASA at your School PR STEM Initiative, April 8-9, 2019, Activity coordinated by Prof. Dolores Balzac (UPR-Mayagüez). Four schools from the Southwest of Puerto Rico will participate of this initiative. “News from the Universe” is a traveling image exhibit about astronomical observatories in which the visitor will learn about science as they stroll through the electromagnetic spectrum. The name of the exhibit is inspired in a quote by Sir William Bragg (Nobel Prize in Physics 1915) “Light brings us the News of the Universe”. The exhibit will be displayed at several locations of Puerto Rico and the Caribbean. This exhibit is being prepared by Dr. Mayra Lebrón and Dr. Carmen Pantoja from the University of Puerto Rico, Río Piedras Campus. "Many Inspired Steps" - an exhibit that celebrates the 5oth anniversary of the Apollo 11 Moon landing. "Sala Eugene Francis", Physics Building, Room #229, University of Puerto Rico, Mayagüez campus. From October 9,2018 till July 20,2019. Coordinators: Prof. Dolores Balzac and Dr. Juan González Lagoa. Exhibit: "Astronauts and their Professions"- A collection of posters to be displayed at the different Departments of the University of Puerto Rico Mayagüez campus (Departments of Physics, Geology, Mathematics, Biology, Agricultural Sciences, Engineering and Education).Coordinator: Dr. Juan González Lagoa and Prof. Dolores Balzac. Facebook Livestream of Talk by Dr. Alessandra Abe Pacini in the International Day of Women and Girls in Science. Arecibo Observatory, February 11, 2019 10:45am (Arecibo Observatory Facebook page). Symposium: "Women in Science and Technology" Activity for women in High School and College. March 11, 2019 8:30 a.m. - 1:30 p.m., Conservatorio de Musica de Puerto Rico, Sala Jesús María Sanromá, Activity Organized by the Colegio de Física Fundamental e Interdisciplinaria de las Américas (COFI) RSVP https://sites.northwestern.edu/cofi/registro-charla-de-mujeres-cientificas/. NASA at your School PR STEM Initiative with Kennedy Space Center Ground Exploration Engineers - An activity for students grades 9-12, April 8-9, 2019, Coordinators Dr. Juan González Lagoa and Prof. Dolores Balzac. 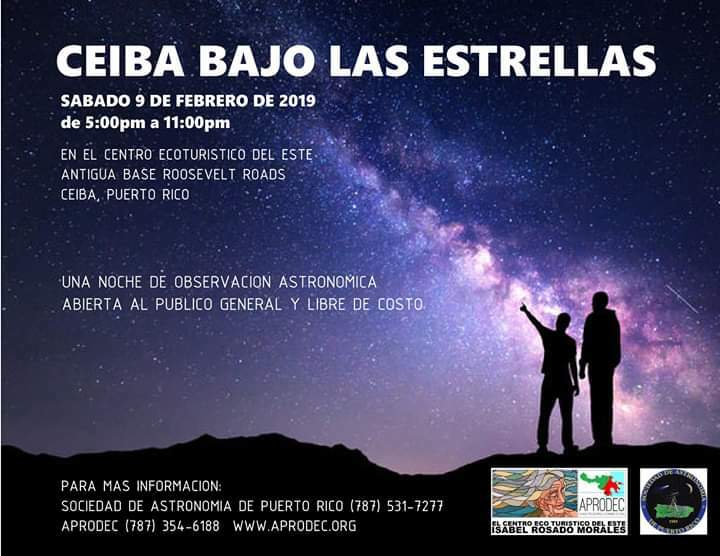 Sociedad de Astronomía de Puerto Rico:"Vieques bajo las Estrellas" March 2, 2019 from 6pm to 11pm at the Malecón del Barrio Esperanza located south of Vieques. Activity open to the general public and free of charge. 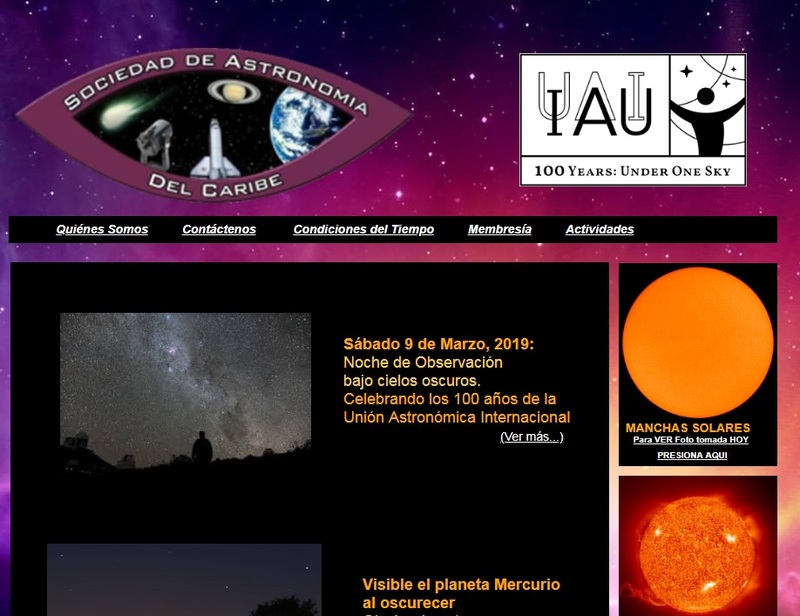 Sociedad de Astronomía del Caribe: March 9, 2019 Observation Night: "Noche de Observación Bajo Cielos Obscuros" Sociedad de Astronomía del Caribe - 9 de Marzo, 2019 desde 6:45 pm en Carr. 303 km. 11.3 interior, entrando por el camino “La Gran Vía”, en La Pitahaya, Cabo Rojo. Sociedad de Astronomía de Puerto Rico -"Mi Municipio Bajo las Estrellas" March 9, 2019, 6:30pm Place:Pista Atlética Marie Lande Mathieu, Levittown. "Moon Landing 50th Anniversary" is a global project project aims to encourage people worldwide to celebrate the 50th anniversary of the Moon landing in 20 July 2019 by organising Moon observations during that day that could as well serve to inspire people on how the Moon missions changed the world forever. The University of Puerto Rico at Mayagüez is pleased to present "Many Inspired Steps" an exhibition that celebrates the 50th Anniversary of the Apollo 11 Moon landing. "Many people were not even alive the last time a person walked on the Moon in 1972. For those who were, time has faded the memories feat. We need to remember, we need to celebrate that great achievement. More than that, we need to inspire children to strive to accomplish what may seem impossible" said Dr. Thomas A Lesser, the exhibition's creator. "Many Inspired Steps" was organized by Dr. Thomas A. Lesser, who has donated the exhibition and is distributed by Audio Visual Imagineering Inc., which has donated the distribution of the exhibition to the University of Puerto Rico at Mayagüez. The exhibit opened on October 9, 2018 and will close on Saturday July 20, 2019. It is coordinated by Prof. Dolores Balzac and Dr. Juan González Lagoa. The exhibit is located at "Sala Eugene Francis" Physics Building, Room #229 University of Puerto Rico Mayagüez campus. It is open for school visits and the general public once a week and at "Open House" activities from January to May 2019. Another project that is part of the celebration of the 50th anniversary of the Moon landing is the Forum: "50 Years of Apollo 11" - April 4, 2019. Event organized by Dr. Juan González Lagoa and Prof. Dolores Balzac. In Puerto Rico we encourage schools to create Science Clubs and participate of the activities of the Einstein Project. To register send an email with the name and address of your school, the name of the teacher mentor to divulgacionastronomia@gmail.com with Subject: Einstein Schools. The groups should complete a summary of the experience at the end of each activity in order that the teacher or mentor will validate. 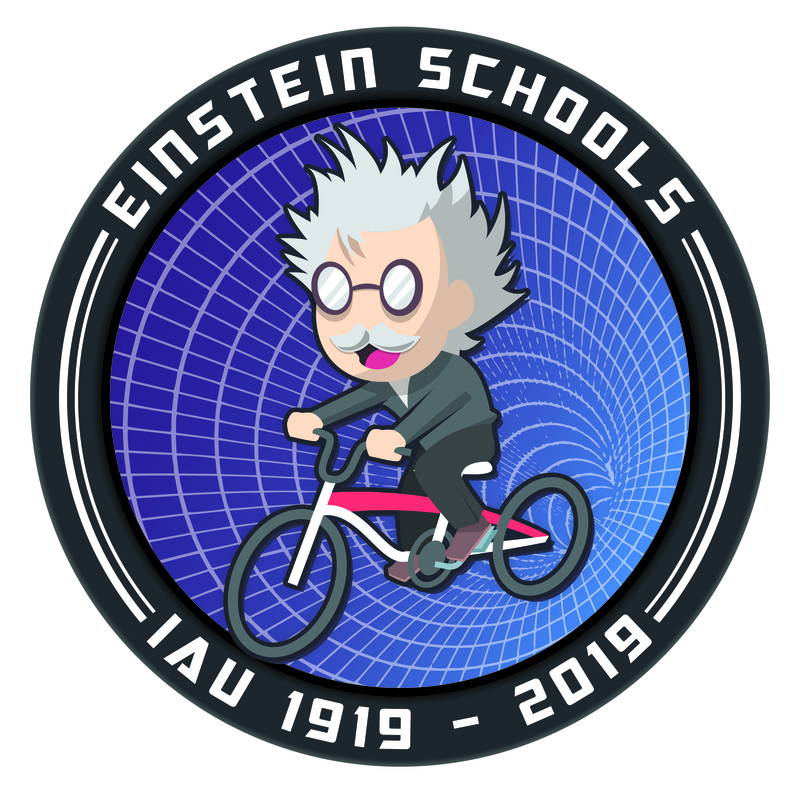 Those clubs that complete 10 of the Einstein Schools proposed projects will be invited to the IAU100 Puerto Rico closing event during which they will receive IAU100-Einstein Schools certificates of participation. This is the opportunity to learn about scientists and their lives. We suggest a list of scientists who were important in the development of physics. Read about them, discuss with the members of your club and create a unique way to tell others about what you have learned. Write a short story, a play, a poster, a video, a podcast or any other interesting fun way you can think of to tell a a story. Report your results to us. Learn about the Earth. - Participate of the Erathosthenes Experiment on March 21, 2019. In this experiment you will measure the size of the Earth. For details on how to participate and to register your school visit http://eratosthenes.ea.gr/ . Find information about the Hyades cluster. Find the trajectory of the May 29, 1919 eclipse on the surface of the Earth. Where is the Island of Principe and where is the city of Sobral? Eddington announced his findings about the 1919 eclipse on Nov. 6, 1919. Find how the newspapers reported these findings. Complete lesson Wave Model Applications from the Perimeter Institute (https://resources.perimeterinstitute.ca). Watch a video about relativity on YouTube (duration: 1h 57m)- This movie is from 1979. Remind your students at minute 27 they talk about the ongoing Observations at Arecibo Observatory of the Binary Pulsar. The students can see Joe Taylor who won the Nobel Prize in Physics in 1993 for the observations they are explaining in this movie. Also remind students they will see (at 1:57) a description of M87 which was recently in the news as the first image of a Black hole.
. The objective is to find something interesting related to science where you live, prepare a short presentation to share with another group of students via Skype and post of photo on our School Gallery section.